Yesterday evening, during intermission of the Portland Columbia Symphony Orchestra concert, I ran in to composer David Bernstein, who is the founding president of Cascadia Composers. He told me that a group of eight members of Cascadia Composers will be traveling to Cuba in November to have their music presented there. Then in the following year, several Cuban composers will come to Portland to have their music presented here. How cool is that! To learn more and to help contribute to the effort to underwrite this unique exchange of composers, click on this Cuba Initiative gofundme site. Oregon Symphony's Russian program satisfies...ultimately. The Oregon Symphony played the final night of a Russian-heavy program at the Schnitz Monday evening, featuring Shostakovich's Symphony No. 1 in F minor and Tchaikovsky's Concerto in D Major for Violin and Orchestra, featuring Dutch player Simone Lamsma as soloist. The folks who were parking during the "parking overture" didn't miss much, unfortunately. Danish composer Carl Nielsen's Helios Overture was flat from the start, literally and emotionally. A sour start and continued pitch issues from the horns muddied what should have been a quivering, bracing opening, and the orchestra followed suit with an underwhelming delivery. Surprising, frankly, because this is the sort of thing at which the OSO usually excels. Immediately following was the Shostakovich. This piece felt like it took a minute or two to get going, but because of its length it could afford an unfortunate if understandable 'warm-up' phase. With so many rapid-fire entrances and exits from so many sections, the orchestra had to be right on cue--constant attention to the conductor was key. They achieved this, and there were tasty treats from many sections and players, including second chair first violin...a solo executed with just the right blend of gusto and restraint. The second movement featured brilliant switching between the principal themes as they were bandied about between the sections. The opening of the Lento third movement featured an oboe solo floating gently like a bird soaring over a hushed sea of strings--lush and full bodied, the strings perfectly captured the mysterious spirit of the movement. The final movement closed in raging moments of brutal exclamations from the brass and percussion. Such rapidly and radically shifting moods throughout the piece required a steady and able hand, and resident conductor Paul Ghun Kim ably guided them through the treacherous course. The second half consisted of the violin concerto, and Lamsma had the audience hooked right from the start. She opened with a fine, broad cantabile, featuring a rich lower range. Her technical brilliance was unmistakable from the start--she executed difficult chordal and scalar passages with exciting thoroughness and clarity. Her lengthy, spritely cadenza was intensely interesting, featuring daring harmonics and glissandi. During the Finale: Allegro vivacissimo she played with a rapidfire saltando that seemed at times to throw down a friendly challenge to the orchestra: just try and keep up! My tongue is planted firmly in cheek when I say she was having far to much fun for a soloist in such a serious work. "Thile will tape five or six episodes in the show’s longtime home base – the Fitzgerald Theater in Saint Paul, Minnesota – and make the rest around the country, including New York. For now, he will commute from Portland, Oregon, where he lives with his wife, actor Claire Coffee, and their 11-month-old son, Calvin." So, don't be surprised when you bump into Thile at a coffee shop. A grand piano and four huge gilded picture frames are the only props that Mona Golabek needed in order to tell the poignant, bittersweet but uplifting story of her mother’s flight from the stranglehold of Nazi-crazed Vienna to freedom in London and the solace that she found in music. 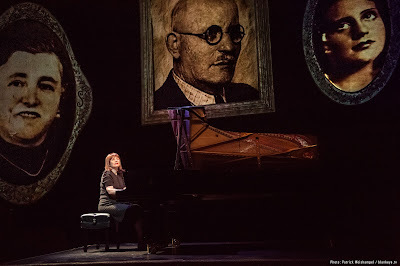 Over the course of 90 minutes, Golabek delivered “The Pianist of Willesden Lane” with genuine, heartfelt emotion that connected immediately with the audience at Portland Center Stage on Friday evening (April 15). 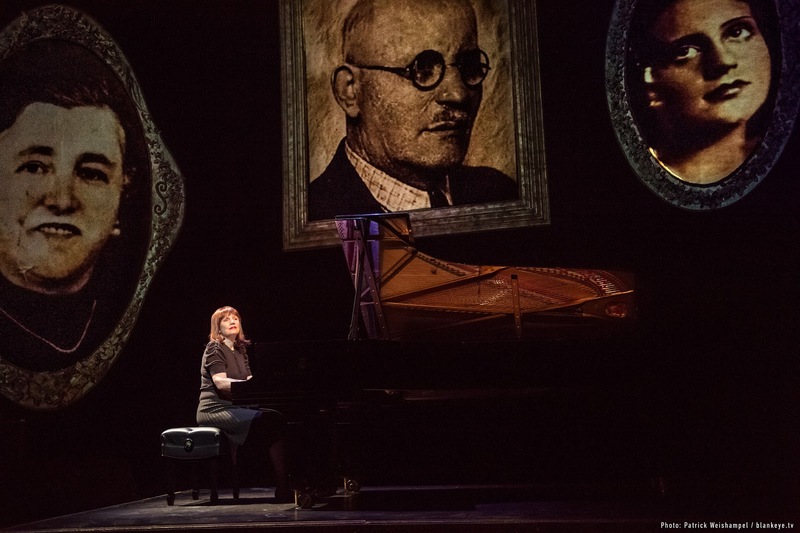 The production was directed by Hershey Felder, who adapted it for the stage from “The Children of Willesden Lane,” which was written by Golabek and Lee Cohen. Being a classically trained pianist, Golabek interlaced her mother’s story with piano pieces that her mother had played. Stepping up to the Steinway Grand that was placed on a raised platform in the center of the stage and playing with authority, Golabek performed snippets of Debussy, Beethoven, Chopin, Rachmaninoff, Scriabin, Bach, and Grieg. Photographic images and historic film footage effectively underscored various points of the story, helping the story to move along at a steady pace. The story resonated even more, because of Golabek’s uncanny channeling of her mother and her ability to modulate her voice to portray various characters. The story began in 1938 in Vienna, Austria where Golabek’s mother, Lisa Jura, lived with her parents and two sisters. While Vienna descended into the madness of Nazi-inspired control, 14-year-old Jura’s world revolved around her piano lessons and the dream of playing Grieg’s Piano Concerto in the Musikverein – the gilded concert hall that is the home of the Vienna Philharmonic. But Jura’s father, after losing most of his income because of the abusive laws against Jews, turned to gambling. On Kristallnacht, he returned home from an evening of gambling – beaten up but still in possession of a ticket that would allow one of his children to go on the Kindertransport to Great Britain. That ticket was given to Lisa. After she got to London, Jura’s worries were not over, but she preserved, living with other children from the Kindertransport in home on Willesden Lane that is run by a stern Mrs. Cohen and working as a seamstress in a factory to make clothing for the British troops. She also kept playing the piano, and was at the keyboard when German bombs fell on her home. She miraculously survived the bombing and later qualified for a scholarship to study piano at the Royal Academy of Music. Her teachers found her a job playing in the lobby of a hotel that served as the temporary quarters for soldiers. It is there that she was introduced to a French officer who later became her husband after the war. And yes, as part of her graduation, Jura plays the Grieg Piano Concerto. Golabek’s storytelling was riveting but it never became melodramatic – even when relating moments of extreme loss and pain. She terrifically evoked scenes of Vienna in those bygone years and of London during the war, including the music that her mother knew so well and clung to in a desperate way that helped her endure the chaos and loss. Oregon Symphony Association Board Chair Jack Wilborn today announced that the Symphony and the American Federation of Musicians, Local 99, have ratified a new three-year collective bargaining agreement for Oregon Symphony musicians. The contract begins retroactively from September 2015 and runs through May 2018. “On behalf of the entire Board, I extend my deep appreciation to our musicians, our President, and everyone involved in these negotiations for their diligence and collaborative spirit. With this agreement, we will become an ever-stronger force in our community,” he said. Shortly after he joined the Symphony in July 2014, President Scott Showalter and the union extended the musicians’ previous collective bargaining agreement, which covered 2011 through 2014, for one year. Although that extension expired in August 2015, orchestra performances and operations have continued while this new contract was negotiated. Under the new contract terms, musicians will receive annual cost of living increases based on the Consumer Price Index average of all U.S. cities. The musicians will continue to receive full health care coverage for themselves and their dependents, along with pension contributions of 5% each year. The contract also provides for greater flexibility in rehearsal and performance schedules. Separately, the musicians’ union also ratified a new electronic media agreement, which will allow the Oregon Symphony to invest in radio broadcasts, online streaming, and recordings. These salary increases for musicians are the first since the 2011/12 season, ending a post-recession period during which musicians and administrative staff took salary cuts to balance the budget. The Oregon Symphony has balanced its budget in each of the last six years. Since Showalter’s arrival from the Los Angeles Philharmonic, the Oregon Symphony has enjoyed significant growth. The 2014/15 season set records for total tickets sold, sold-out concerts, ticket revenue, new ticket buyers, donors, gift totals, and new donors. During the current 2015/16 season, the Symphony earned a Grammy nomination and expanded its broadcasts, while diversifying its concert series and producing more community and education programs. The recently announced 2016/17 season includes a 20% increase in the total number of classical performances and a 14-60% increase in the number of concerts in classical subscription packages. Advance ticket sales are outpacing last year’s sales at this same date by double-digit percentages. The Violin Concerto of Thomas Ades scratched the surface of many earlobes at the Oregon Symphony concert on Saturday evening (April 9th), leaving most of us in the audience at the Arlene Schnitzer Concert Hall feeling puzzled even though we were sure that the featured soloist, Augustin Hadelich, had done everything in his command to convey something of the piece’s subtitle, “Concentric Paths.” The concerto, conducted by Carlos Kalmar, began in the ultra-high range of the violin with some near nail-on-the-chalkboard notes. The stratospheric quality at one point was accompanied by two piccolos and later the Hadelich and the orchestra created a weird whistling effect – or perhaps my synapses were temporarily overloaded. In any case, when Hadelich finally descended to a slightly lower range, I felt a sense of relief, but that was cut off with a bang of the bass drum to conclude the first movement. The second movement featured a herky jerky – stop/start sequence that paired Hadelich’s violin with two trumpets and a trombone. Several big whams from the percussion gradually tapered off into the distance so that Hadelich could float a wandering line that turned into a lament. Hadelich also executed a series of ascending lines stuffed with double-stops. A rambling bass trombone and tuba segment formed an odd passageway for Hadelich to show off some lightning-fast technique that later slowed down to a near harmonious center. The tone became darker and the atmosphere slightly ominous as Hadelich probed the lower register of his violin before the movement ended solemnly. The third movement showed a lot of rhythmic drive by all of the strings and an odd melody followed by passages that were tossed into the woodwinds and other sections of the orchestra. Hadelich carved out a quixotic melody and the entire ensemble negotiated several brief stuttering pauses before the piece ended. The audience responded warmly to Hadelich’s virtuosic performance, and, he followed it with mind-boggling performance of Niccolò Paganini’s “Caprice No. 5. He took it at a devilishly fast pace, playing every note spot on and even varied the volume. It showed that he could play something that everyone could follow – even if it was at Lamborghini-esque speed, and the audience loved it to pieces. After intermission, the orchestra explored the contrasting elements of Edward Elgar’s First Symphony. I really enjoyed the way that the noble themes would sneak in from nowhere, and the musicians excelled with dynamics – shading phrases by turning down the volume – accelerating energetically – punctuating passages with a lump of sugar as needed. The soft, diffuse sections were sort of like a fog creeping in ever so slowly. Concertmaster Sarah Kwak expressed her solos with exceptional musicality as did guest principal flutist Martha Long. The strings dispatched the some of the speediest lines I’ve ever heard with ease and they also created graceful moments that flowed effortlessly. The piping high flute and piccolo passages, the soaring French horns, and the wonderfully forlorn sounds from principal clarinetist Todd Kuhns were memorable highlights of the evening. The concert opened with the best piece ever written by a teenager, the Overture to “A Midsummer Night’s Dream” by Felix Mendelssohn (composed when he was 17). The fleet fingerwork by the strings, insistent braying of the horns, and the playful exchanges between various sections of the orchestra made this piece a delight. Despite the exceptional playing, the orchestra looked pretty glum on the whole, and that is not an encouraging sign to those of us who sit in the audience and wonder why. Fortunately, the musicians’ professionalism and sheer talent kicked in, and they responded to Kalmar’s directions. Sometimes you can get too much of a good thing even when it comes to music. That’s the way I felt after attending the Vancouver Symphony concert on Friday afternoon (April 9th) at the Skyview Concert Hall. The program featured solos from the three gold medalists of the orchestra’s annual young artist competition and orchestral works by Maurice Ravel, Paul Dukas, and Richard Strauss. All of pieces were tied nicely together with the theme of youthful fantasy or magic, but the very full program got underway late because of an announcement of the orchestra’s lineup for next season – which looks like the most ambitious ever for the VSO – and an intermission mix up. Consequently, two and a half hours passed before the final notes were played. The spotlight on the young and talented fell first on cellist Richard Lu (age 18), who played the first movement of Edward Elgar’s Cello Concerto. In addition to conveying the wistful sentiment at the core of the movement with fine legato lines and an occasional sad slur, Lu commanded the fast passages deftly, including a few series in which his bow quickly skipped over the strings ever so lightly. Pianist Lauren Yoon (age 16) excelled with her playing of the first movement from Frederic Chopin’s Second Piano Concerto. Yoon created a refine and elegant atmosphere that was well-balanced yet also allowed the leading tone to be slightly louder. Pianist Anthony Zheng (age 18) raised the energy and volume level with a scintillating performance of Franz Liszt’s “Totentanz.” Zheng contrasted the massive fortes and delicate pianissimos with panache, and he also excelled with the fleetest passages that featured an extended series of repetitive, close-knit notes. The flashy arpeggios and racehorse finale got everyone out of their seats for a loud standing ovation. As if to underscore the youthful soloists, the orchestra gave an inspired performance of Dukas’s “The Sorcerer’s Apprentice.” The snappy trumpets and the perky bassoons helped to create a hubbub of mischief while the sound of the strings swirled about. Contrabassonist Nicole Buetti was especially deserving of praise for her evocative playing. The light-hearted mood continued with Strauss’s “Till Eulenspiegel” with principal clarinetist Igor Shakhman taking the lead role as the mocking, ant-establishment prankster. Superb playing by the French horn section (especially principal Allan Stromquist) and the woodwinds added to the merriment, which contrasted well with the serious demeanor of the strings and brass. Music director Salvador Brotons revved up the brass and percussion for Till’s execution and made sure that the prankster’s whimsical spirit lingered afterwards. The concert began with Ravel’s “Mother Goose Suite,” which the orchestra played well, but a shorter, perhaps livelier piece might have worked better. Principal oboist Karen Strand stood out for her clear and focused playing as did concertmaster Eva Richey. The third movement, with its Oriental leanings, needed more dynamic contrast, but the fourth, which dealt with the “Beauty and the Beast” story, had a wonderfully pensive quality. Brotons conducted the piece without a baton, ensuring the music’s soft and delicate nature. Next season looks like a promising one, with pianist Orli Shaham (return engagement) and clarinetist David Shifrin being two major artists who will be featured. The orchestra will also add a concert, playing a pops concert in early December, and that is a very savvy move. 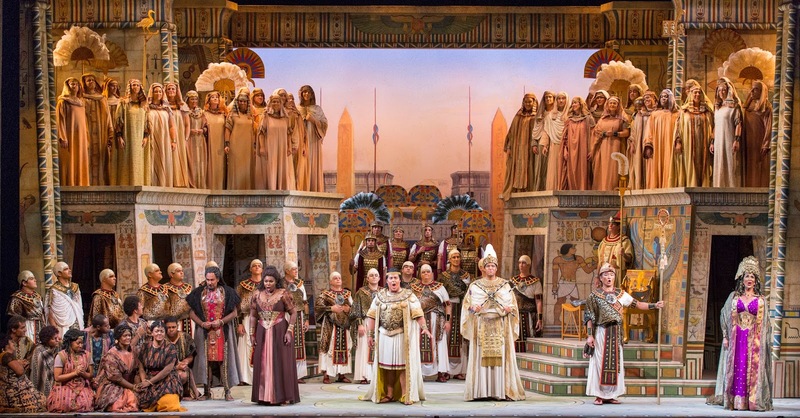 A couple of weeks ago, I visited Sarasota, Florida to observe and write about Sarasota Opera's final productions in a 28-year-long-effort to perform every opera that Verdi wrote (27) plus the alternative variations (6) and every song, choral work, orchestral work, piano piece, chamber work, you-name-it piece (including fragments). 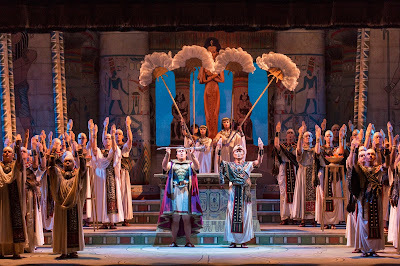 Because of other writing assignments, I'm just now getting around to writing a review of the company's production of "Aida," which took place on March 19th. The cast was exceptional across the board with Michelle Johnson in the title role, Jonathan Burton as her lover Radames, Leann Sandel-Pantaleo as Aida's rival Amneris, and Marco Nisticò in the role of Aida's father Amonasro. Johnson displayed a strong, clear tone that revealed the emotional conflicts of her character's situation. Burton held forth with terrific heroic singing that matched up well with Johnson. 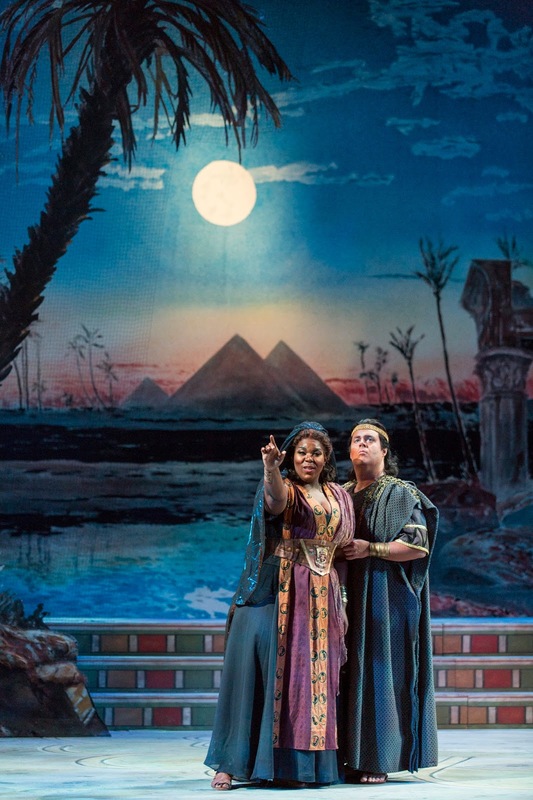 Sandel-Pantaleo almost stole the show, becoming completely caught up in the frustration of Amneris in her quest of win the love of Radames. 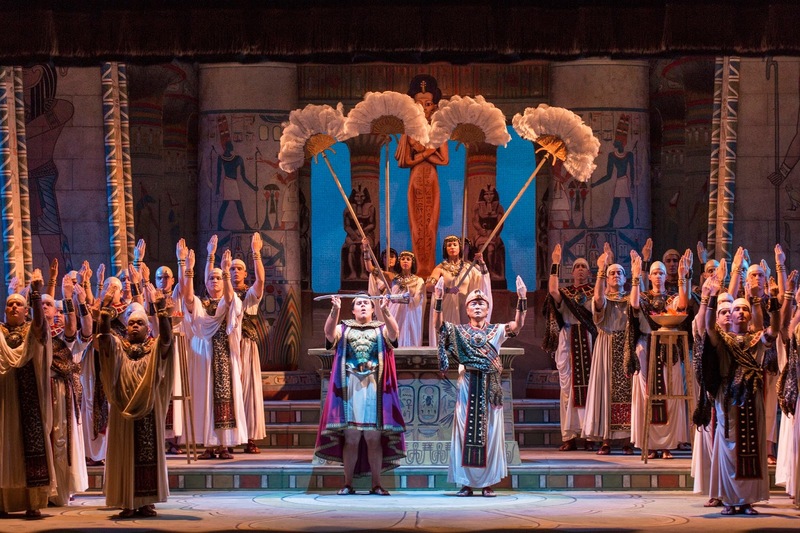 As Ramfis,Young Bok Kim conveyed ample gravitas chief priest, and Jeffrey Beruan, a graduate of Portland Opera's young artist program, created a stalwart King of the Egyptians. The Sarasota Opera Chorus, expertly prepared by Roger L. Bingaman, kept the energy high with superb contributions throughout the performance. Artistic Director Victor DeRenzi paced the enterprise very well. One thing to keep in mind is that the Sarasota Opera house seats 1,100; so the singers don't have to strain their vocal chords to the limits in order to be heard. 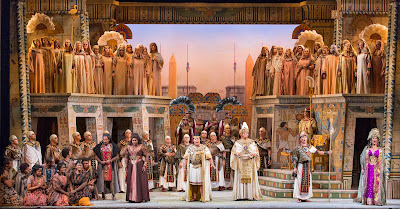 But with a smaller house comes a smaller stage area, which could cause traffic jams especially with productions like "Aida" that require a lot of singers for the big scenes. Stage director Stephanie Sundine did an outstanding job of keeping all of the bodies in a flow was natural (including six on stage performing trumpeters during the triumphal march scene) and made the story easy to follow. Choreographer Miro Magloire deftly managed the big scene that involved the march of the Ethiopian slaves and a ballet at the same. Despite the limited space, onstage trumpets were used to great effect. 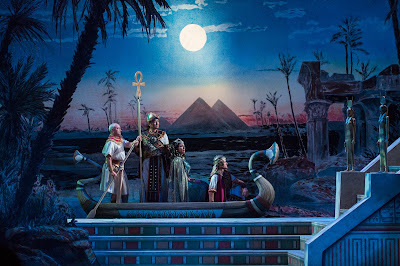 The scenic designs of David P. Gordon evoked an ancient Egyptian wonderland of temples and columns with a hodgepodge of hieroglyphics and human figures. Traditional costumes by Howard Tsvi Kaplan perfectly matched with the sets, and all was lit admirably by designer Ken Yunker. I enjoyed the programming of the Oregon Symphony concert performed at the Arlene Schnitzer Concert Hall on Saturday, March 19th immensely. In the introduction to the concert, Conductor Carlos Kalmar explained his theme of “School of Variations,” and the program lived up to that. First up was Johannes Brahms's “Variations on a Theme by Haydn" played with no pause between movements. I lost count of the variations at some point, but just trying to keep track of them kept me more aware of the movement of the theme and the color shifts. The opening was stately and gracefully done, the sound well-balanced between the winds and strings. This was a great introduction to the rest of the piece. The orchestra showed off terrific musicality throughout: subtle and soft when needed, beautiful gentle horns and bassoon, and lovely unisons of flute and clarinet with well-shaped phrases. Variation 7 especially had sweet low celli and basses playing an almost Viennese sounding dance with stretched beats that breathed like a lover’s catching breath. Very poignant. I heard all voices clearly in the Brahms, when soft or fuller as in the Finale where all the instruments re-proclaimed the theme clearly before fading out to a last trumpet call. Next on the program was a smaller ensemble for Haydn’s Symphony #90 in C Major. The transparency of the sections reminded me of the first time I heard Glenn Gould play Bach. I could hear every part, every counter-melody clearly and equally. The tuning of the winds in the opening struggled, but eventually gelled. The flute solo and the brass ensemble was great. The lower string pizzicato section shifted into a more muscular Haydn in the middle with the other strings, then back to a dance! Principal bassoonist Carin Miller rocked the second movement with trills and register key flips done lightly. This was followed by a clear and warm flute solo by principal Martha Long with easy and confident grace notes. The strings' decrescendos on upward ending phrases were amazing. At some point it did sound like someone’s string peg loosened or a string broke, but it was fixed quickly. Horns and brass in the third "Menuet" movement were super. The fourth movement, an "Allegro Assai," had some intonation problems in upper strings. The orchestra took a BLISTERING pace, especially well played by the bassi and celli as the orchestra raced to … a few false endings! The audience, though perhaps forewarned via a hint in the program notes, could not figure out if the piece was truly ending. Yet another musical joke by Mr Haydn, well done by the OSO. There were some Baroque improvisations by the oboe and flute in the second movement and perhaps in the final false endings as well, but it wasn’t completely clear when and where they were happening. I think they started with their best and most complex improvs first, instead of building. But they DID improv, not something you hear everyday from the OSO! Third up was Richard Strauss's “Don Quixote." Have you ever seen a Tuba mute? “Now that’s a MUTE!” was all I could think. Also on stage was a windmill/storm machine in the percussion battery. So you know it’s going to be fun. And it was! This piece had the most forces onstage, including the featured solo cellist, Christian Poltéra. The opening was drunk. Clearly Don Quixote had been sampling some Spanish wine. Let me clarify: Don Quixote is what is called a tone-poem. I’ve been asked “what’s a tone-poem?” by a lot of my friends. I think of it as music that is so composed as to portray a story line, the music making pictures in your head of the action in the story. Strauss was a master at it, and the opening of Don Quixote put me immediately on the plains of Spain, slightly inebriated! In keeping with the "School of Variations" theme of the concert, the middle movement of the Strauss is entitled “Theme and Variations”. Strauss also wrote some of the most difficult orchestra music to play. Most was very well played, but I think I have heard tighter playing overall in past concerts by the OSO. One of the standouts in the Strauss was the principal clarinetist Bharat Chandra. I’m a recovering clarinetist -- playing the low register without over-blowing and sounding blatty is HARD. He played with a rich, round, and beautiful tone throughout, both in his opening solo and again at the end when he played with tenderness in his higher register. Fantastic! The entire viola section had numerous soli sections that were very well played. Assistant principal cellist Charles Noble substituted at the last minute as the solo violist and played confidently, accurately, with a handsome tone that was clearly audible. Concertmaster Sarah Kwak had the solo violin parts, and while spot on with feeling, speed, and accuracy, her playing was for the most part barely audible which was a shame. The featured soloist, Mr. Poltéra, also was buried more often than not, especially in the first movement. When I could hear him, the tone was harsh and at times not in tune. I preferred his lower register and his more melodic playing in the later movements. Tenor tubist Demondrae Thurman excelled with gorgeous playing. The trumpet and french horn passages that were an octave apart were also excellently done. The storm section with the windmill/storm machine was flat-out terrific and thrilling. Huge and noble, dark and sad at the same time. The pizzicato section with Poltéra and the bassoon solo was fabulous as well, then moved into all seven french horns and three trumpets playing simultaneously. Wow! The low strings were tender, then combative, then menacing. All of this texture wound from sublime to drunk, to madness and eventually to peaceful resignation at the Finale. All in all, it was an enjoyable journey through variations via Austria and Germany to Spain! Nan Haemer is a professional singer and voice teacher. Sunday April 3 saw the second concert of Portland Concert Opera's inaugural offering, Tchaikovsky's one-act opera Iolanta. Performing at Portland's Old Church, the group delivered an exciting rendition that heralds a promising future. Consisting of active professional opera singers, the level of talent in this one small building was staggering. 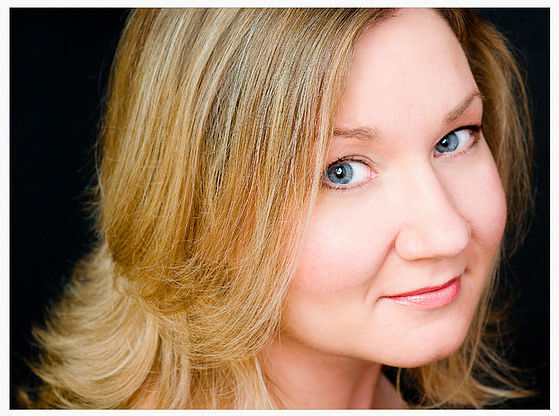 Kimberly Giordano sang the title role with a warm and remarkably polished voice. She invested the role with true emotion that only added to her vocal performance; when toward the end Iolanta could finally see, there was nothing lacking for a sense of wonder and amazement in her rendering. Bass Damien Geter's King Rene was amazing to listen to. Possessed of a rolling, resonant voice even at the lowest register, both his performance in ensembles and as a soloist was compelling. Zachary Lenox sang the role of Ibn Hakia, and his Monologue was driving and pointed--one could feel the tension crackling between Ibn Hakia and the king. Also of note was Aaron Short, singing the role of Vaudemont. It's always a pleasure to hear a tenor singing completely full-voiced and have it sound so effortless, natural and powerful. It wasn't just the principals evincing an incredibly high caliber of singing. A number of voices familiar to Portland opera fans were among the group as well. Erik Hundtoft sang the role of Robert with gusto, singing a passionate and robust aria. Beth Madsen Bradford was Marta, and it was a sheer pleasure to hear the quality and richness as she sang deep into her modal voice early on. There were fine ensemble pieces, including a swooning trio with Marta, Brigitta (Jocelyn Claire Thomas) and Laura (Rebecca Sacks.) The final chorus with the entire cast was epic, with a quiet a cappella moment after a spectacular fortissimo that was arresting in both effect and execution. The small orchestra was full of excellent players as well, and artistic director Lance Inouye (also wielding the baton) clearly has a vision for this ensemble, a vision that should excite Portland opera goers and fans of downright excellent singing. If there was any problem at all it was that the voices were so large for such a small hall...but if that's a problem, it's one I'll gladly endure.